The User Acquisition report contains statistics on app install sources. The report may contain data on sources detected using tracking, as well as organic sources. The report allows you to pull out certain users by defining data segments. The following segmentation categories are available for the report: traffic sources, users, and devices. To view the list of partner trackers, click on the partner's name in the report (when the data is grouped by media source). When the data is grouped by tracker, you can view the list of all the tracker parameters by clicking the tracker's name. The number of clicks that users made. All Installations. The total number of installations, including application reinstallations. New Installations. The number of new (unique) installations. Reattributed Installations. The number of repeat installations for trackers with the reattribution option enabled. Deeplinks. The number of times the application was opened via deeplinks. The number of user sessions for the entire time since installation. The percentage of the total number of users who have a certain number of sessions. You can set the number of sessions. The traffic source selection for the chart. 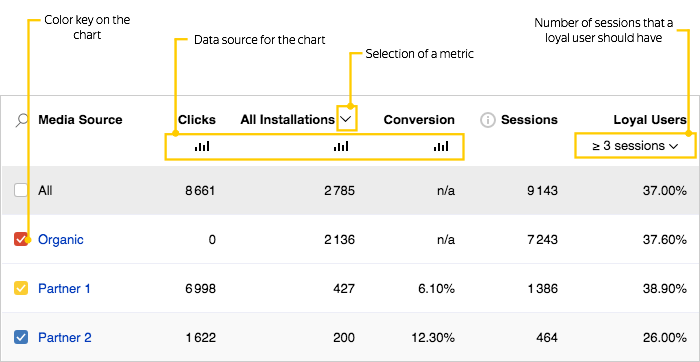 Enables you to choose which metric to show on the chart: clicks, installs, or conversion. 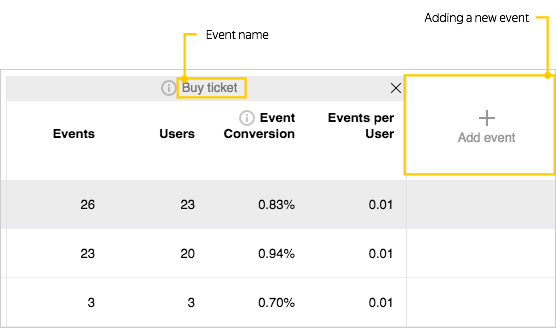 You can add up to 5 events to the report to monitor the information about an event in the context of the traffic source. The total number of events that occurred in the application. The number of users who had this event occur in the application. The percentage of users with the event out of the total number of users who installed the application. The average number of events per user. This metric is calculated as the ratio of the total number of events to the specified metric (the default metric is "All Installations"). To show the event information, select it in the drop-down list. Sending an event should be configured when the SDK is initialized.